Hi! This is the first fan fiction I've written in quite some time! I've tried to do my best to keep everything compatible with canon, but I am certainly likely to have gotten something wrong. Please feel free to point these error out, but please also be patient. I am also giving a content warning. These stories are likely to be quite dark. The life of a tanker in the Battletech universe seems quite grim, and I would like these stories to reflect that. While I intend to treat darker subject seriously, I apologize if I offend anyone. Again, please let me know if I post anything you find objectionable. If I got something wrong, I would like to know. This is (hopefully) the first entry in the story of Schaller's Shellbacks, a mercenary armored unit that begins life shortly after the War of 3039. I intend for their unit history to extend to the Jihad, but I don't know if I'm up to writing that far into the story. If you have any questions about the unit, feel free to ask. I am going to try to post at least one entry of 1500 words or more per week. There will likely be more than that, but that is the minimum goal I want to strive for. This is as much to get me back into writing as it is because I have a specific story to tell. Kommandant Thomas Schaller heard the incoming attackers before he saw them. Mechs, even light ones, make an astonishing amount of noise while at a run. The wham-wham-wham of tens of tons of equipment hitting the earth was hard to miss even at a distance. This whole damned invasion had just gone south. High command had sent him and is tank battalion here to command a garrison force against a conquered world. With combat operations against the Dracs in high gear, battlemech forces were being assigned elsewhere. The 11th Lyran Regulars were off hunting the saboteurs and bandits who were making life outside the capital miserable. The 4th Skye regulars were guarding the spaceport against potential attack. God knew what the 2nd Donegal Guard were up to. All of them had found reasons not to be assigned to protect the Diverse Optics plant. And so here he was, alone and unsupported. Intel said that the incoming mechs were painted in the colors of the 12th Sun Zhang cadre. The cadre they had also assured local commanders had left the planet. Thomas wasn’t certain the information he was getting was accurate, but it was all he had. He tucked his head back under the cupola. Whoever they were, he had to defend against them. “3rd Battalion, stand by to fire.” He said, putting the order out over the comm. The order was redundant, and he knew it. He also knew that his men needed to hear his voice. A calm commander meant a calm command. There wasn’t much else to do at the moment. Recon had given him enough notice to array his forces against the incoming threat. He;had put his men in a position to succeed as best they could. And it might not matter. A full battalion of mechs that weren’t supposed to exist were about to hit his tanks hard. Tanks might be tough, but mechs were tougher. He’d tried to get his units into as defensible a position as possible, but short of destroying parts of the factory complex for cover there wasn’t much he could do. Not that he hadn’t been tempted. The wham-wham-wham noise through the open hatch was getting louder. Thomas pulled it closed, then adjusted his respirator gear as he sat back down in the tank commander’s chair. He hated this planet. Even the air tried to kill you here. He barely had time to get his hands on the sensor controls before the first mech appeared. A fast moving Jenner came sprinting into view, blazing white against the drab brown dirt of the ridge it crested. “Sir?” asked the driver sitting to his left. “Never mind,” said Thomas. He thumbed the transmit button on his radio. Long ranged missiles flew from launchers as soon as the word “fire”’ passed his lips. The rest of 3rd Battalion had been ready, and the white trails of rocket motors carved a ragged arc towards the intruder. Thomas heard his gunner curse as nearly all the missiles, including his own, flew past the incoming Drac mech without detonating. A scant few impacted the legs of the oncoming mech. They didn’t even slow it. Time for more gunnery practice, Thomas supposed. The Jenner was joined now by two more ‘mechs, both moving at a run. Thomas knew one as a Spider, but the other he didn’t recognize. He thumbed the comm suite to address the rest of his platoon. “Charlie, Delta, target hostile left. Brave, right. Alpha, center”. Two of his tanks shifted fire on to the unknown machine. A third one spat autocannon fire at the Spider. He felt the turret of his own tank shift to track the Jenner. A moment later the chattering roar of his tank’s autocannon drowned out everything. Thomas watched a line of armor splinter off of the Jennier’s legs. It briefly stumbled, but kept moving. That seemed to have gotten his attention. The Jenner turned to point its stubby arms in his tank’s direction. Thomas saw a flash from them as the Jenner’s pilot triggered laser fire. A series of dirty grey smoke puffs signaled the launching of missiles. Thomas felt the sudden spike of cabin temperature that came with la laser hit. A moment later a trio of impacts rocked the tank. Damage warnings bloomed on his display, but nothing critical had been hit. The impact had bounced him around in his seat, and he shifted himself back into place, finally thinking to buckle in. After a moment, Thomas was suddenly aware of the sudden stink of the local atmosphere. He spluttered a cough as he pushed his ill-fitting breath mask back in place. The sulphurous smell from the poisoned air lingered in his mask. There were more enemy mechs now. A full dozen of them could be seen between his perimeter and the ridge. Several of them witn longer ranged weapons were directing fire at his own forces. Time to reduce his exposure. “Charlie, Delta, Move to position 2,” he ordered. Bravo and his own tank stayed in place, spitting covering fire at the incoming enemy units. There were quite a few of them now. “Roberts! What’s the holdup with that Jenner?” he called to the gunner. Thomas fought the urge to sigh, or yell, or even weep at the reply. He’d taken Roberts on because the man was a wizard with guns against heavier opponents. He’d always somehow known just how to bring down the big boys. 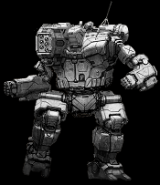 Medium, assault or heavy mechs with heavy armor always seemed to fall to him. A Jenner was none of those things. Somehow one of the weakest mechs on the field might kill them all. Roberts could find a weak point like no one he knew, but he couldn’t lead a target so save his, or anyone else’s life. “Let the computer lead for you,” Thomas ordered. Thomas knew the gunner would sulk, and didn’t care. He returned his attention to the tactical display. The trailing element of his platoon had reached their secondary positions. “Alpha, Bravo, move to position two,” he ordered. His tank and its mate began to move under the covering fire of Charlie and Delta. Above him he heard Roberts curse as the sudden movement of the tank threw off the aim of another autocannon burst. “Hold the curs’t tank steady!” the gunner bellowed. The driver wisely ignored him as he reversed the tank to a more defensible position. Ahead of them Thomas saw the unknown mech sprawl to the ground, dropped by the paired fire of two of his other tanks. All around him the battlefield was a swirl of chaos. Thomas felt the noise and lights of the battle beginning to cloud his mind. He needed to concentrate. On the tactical plot a bright white mech caught his eye. It appeared to be a Charger with some sort of decoration added to it. “Roberts, target the Charger,” he ordered. “Sir?” asked the gunner. Thomas looked up and saw Roberts’ confused face. Roberts rotated the turret and sent all of its fire towards the enemy mech. Explosions rocked the huge machine as the autocannon and missiles impacted all over it. A tank from another platoon subsequently sent own fire into it. The mech wobbled like a drunkard and fell. It hadn’t been knocked out yet, but the combined fire had been more than the pilot could handle. It struggled again to get upright, only for more fire to reduce its head to a wreck. Robert felt a moment of jubilation, followed by the feeling he’d forgotten something. The whole tank shook as the Jenner landed its 35-ton bulk beside the tank. Thomas felt the heat spike of the laser fire against the tank’s hull, then braced himself for what came next. At such a short range it was nearly impossible for the missiles to miss. Two of the missiles blew chunks of armor from the side. One more impacted the side of the tank’s main gun. The last found a space between the rear of the turret and the top of the tank. The explosion lifted the turret from the turret ring, slamming it down again off-center. Chips of shrapnel flew around the inside of the tank, showering men and equipment with razor sharp fragments. Thomas felt a tug as though something had grabbed him by the nose and yanked. A red spray and a grey cloud appeared at the edges of his vision. He frantically looked around the tank to assess the damage. Roberts was screaming. The turret’s off-center landing had crushed his leg between the lower edge of the turret and the frame of his seat. Next to Thomas, the driver was gasping, a crimson river of blood pulsing through the fingers the drive held clamped to his throat. After a moment Thomas realized that his own breath mask had been smashed. He reached feebly for an emergency oxygen container, only to see an indentation in its side and hear a hissing noise from a hole at the center of it. As he passed out an odd thought struck him. Why couldn’t he smell anything? Good start. I like how you have gone with tanks an underrated force in BT. What type of tank were they in. In this case, Schaller's platoon was composed of Pattons. Thomas had an itch, and tried desperately not to scratch at it. That happened a lot these days. It had taken him weeks to stop himself from scratching at them. When he was tired, or stressed, or just bored a tickle would start along the angry red lines that marked where his sutures had been. Unfortunately, that was a lot these days. The invasion of Kessel had not gone as planned, and plenty of blame was flying around. Most of it seemed to be directed at other units within the invasion force, but more than a few officers were simply striking out at anyone in the vicinity they could get away with snapping at. Now Thomas found himself in a waiting room outside the headquarters office hoping that Hauptmann-General Von Frisch was not such a man. Thomas greeted his summons to the office with both dread and optimism. After weeks, months really, of inactivity he might finally be allowed to return to his unit. Or he might find himself up on charges of dereliction of duty, if the Hauptmann-General was feeling vindictive. The man’s aide appeared in the hatchway. “Hauptmann-General Von Frisch will see you now,” she said. She stood aside to allow Thomas to pass. He nodded his acknowledgement and proceeded past her into the office beyond. Von Frisch was a surprisingly youthful man. He appeared to be little older than Thomas himself. He stood as Thomas entered. Thomas tried to read the man’s expression. Unfortunately, it seemed than Von Frisch was an excellent poker player. “Kommandant Schaller please have a seat,” said the Hauptmann-General, waving Thomas to a nearby chair. Dutifully, Schaller took a seat. The sense of dread he had not realized he was hanging on to deepened. Von Frisch said nothing for a moment. The two men sat in silence for a moment. Finally, Von Frisch slid a folder across the top of the desk. Von Frisch shook his head. Despite himself, Schaller could not help from interrupting his commanding officer. Thomas has a sudden realization of where this was going. “This is about the Diverse Optics plant.” he said. It was not a question. “I judged the heavier mech to be a bigger threat.” he said. Von Frisch looked Thomas straight in the eye. He shook his head. Thomas wanted to shout that he had done his best. He wanted to point out that he had some of he most capable armor officers in the AFFC ready to take over for him in the even he was not available. He wanted to cry that this just wasn’t fair. Von Frisch placed a hand on Thomas’s shoulder. Doubtless Von Frisch thought the gesture would be comforting. Thomas, however, felt only shame and anger at a move he felt was condescending. It seemed that Thomas’ time as a tank commander for the Federated Commonwealth were over. “I will have my resignation to you by the end of the day,” he said. He was a tanker at heart, and would always be one. If the Federated Commonwealth did not want his services, there were other options. A short, stocky woman came jogging up to Thomas and his companion, a lawyer from Bismarck and Family, Ltd.
After a moment his curiosity got the better of him. “What did you need at the bank?” he asked. Sergeant Rhonda “Ronnie” Rickert gave a wide grin, and the held up a roll of coins. Thomas’ curiosity grew. He arched an eyebrow. Thomas gave her a cool look. “You couldn’t have waited until after our appointment for that? he asked. Thomas stifled a sigh. He took a moment to look her over. “No weapons?” he asked. Weaponry on the grounds of the MRB’s home offices was strictly prohibited. Thomas nodded, trying not to show his relief. Ronnie was tough, but small. She had won every fight he was aware she had ever been in, largely through the impressive array of weapons she tended to keep on her person. Thomas reflexively started to admonish her for demeaning a superior officer, and then stopped. There was no need for that anymore, was there? The three of them stepped through the double doors of the hiring hall, to be immediately greeted by a woman in the robes of a ComStar Adept. She smiled warmly and held out a hand. She led the way through the lobby and down a short hallway. She, the two soldiers, and the lawyer eventually stopped in front of a small, glass-doored conference room. Aguilar held the door for the others, then took a seat on one side of the table while the rest sat on the other side. She slid a clipboard with a disconcertingly large stack of papers on it to Thomas, who then slid them to Mr. Freydrich. The lawyer paged through them, checking for inconsistencies. Thomas mostly ignored him. ComStar had been in the business of bonding mercenaries for literally centuries. They were the only game in town, as it were. Even if the lawyer found something he disliked, there wasn’t much that he, Thomas, or anyone outside of ComStar could do about it. There also wasn’t much reason to worry. There were hundreds of mercenary outfits throughout the Inner Sphere. While many of them ended up going under, the MRB contract was only really a concern for those that didn’t understand its contents. Thomas had hired a law firm specifically to help him navigate its clauses, and they had come highly recommended. After a few long minutes of silence the lawyer looked up from the stack of papers. He nodded, and handed the clipboard to Thomas. Adept Aguilar spoke once again. Thomas flipped to the last page of the document, affixing his signature to the proper locations with a provided stylus. He handed the clipboard to Ronnie, who made an energetic show of signing her own name. She handed the document back to the Adept. “Congratulations Colonel,” said the ComStar representative. “You have one last hurdle, and it is a minor one. You will want to register a name, symbol, and livery with the MRB’s offices at some point. Technically only the name is required, but the rest are valuable pieces of information to prospective employers that choose to contract with the MRB. With that, Aguilar stood, holding out a hand two the two soldiers. Thomas took the offered hand, shaking it firmly. The grip was extended to Ronnie, who pumped it vigorously before the group was led out of the conference room and back to the lobby. Mr. Freydrich turned to the other two. “For the moment I believe that concludes our business,” he said. The tall, brown haired lawyer bowed slightly in acknowledgement. With that the lawyer turned away, heading for a row of communications booths. The two walked through the doors of the MRB building and headed back towards their hotel. Thomas was now several hundred thousand C-bills poorer, and thinking about how much the simple, but clean and respectable hotel was costing him had him fretting about money already. “I’ve got a name for you,” said Ronnie after a bit, as the two walked along. Thomas turned to regard her. He was about to ask her for her suggestion when a bit of motion from the alley they were passing caught his eye. A hand flashed out of the darkened alley, grabbing Ronnie by the collar and dragging her half into it. A kitchen knife flecked with what Thomas hoped were rust spots appeared at Ronnie’s throat. A tall, gaunt man wearing the close-cropped hairstyle of a mechwarrior but ill-fitting clothes that were obviously not purchased for him stood behind the Sergeant. Thomas held up his empty hands to show he was unarmed. He began to reach into his coat for his wallet when Ronnie made her move. She abruptly stepped to the side, the chipped edge of the knife drawing a thin line of blood on her throat as she did so. She reached behind her between her attacker’s legs, gripped, and squeezed. Thomas winced. He’d seen Ronnie break free bolts with one hand that he could swear required a spanner. The would-be mugger squealed in pain and dropped the knife, stumbling backward into the alley. Ronnie fished in her pocket for the roll of coins she had gotten from the bank. She tucked it solidly into a fist, kissed the fist, and the lept into the alley. Thomas did not watch what happened next, but the meaty thud of Ronnie’s fists and the yelps of the muggers pain could be heard as he walked to a call box to call the police. After filing his report, and be assured that a patrol was on its way, Thomas returned to the alley. Ronnie was wiping blood off of her hands with a scrap of what had been the mugger’s clothing. A pile of coins rested at her feet, near the broken plastic wrapper that had contained them. “You all right?” asked Thomas. He removed a handkerchief from his coat pocket and knelt next to his senior noncom, dabbing at the shallow wound across her throat. Ronnie took the handkerchief from Thomas and held it to her own throat, still muttering unprintable things about the now unconscious body in the alley. Ronnie looked confused for a moment, and then smiled. +all the points for hiring a law firm! It seems indispensable to me. The law will likely pop up several times in this series. Me too... I'm kind of surprised they aren't specifically called out in Campaign Operations. The lawyers I've worked with in the military have ALL been indispensable. Negotiators are all different for each state, but if they can't get you in the negotiations they will really screw you in the fine print. There are a lot of stories where incompetent negotiators have really caused trouble for their state. Remember how Rasalhague got screwed. Ignorance of the Law is some lawyer's opportunity to screw you. Wereling, I love your take. There are too few stories with armor anyway. Please keep the chapters coming! The cargo dropship was still ticking faintly as the parts of the hull superheated during re-entry slowly came down to the ambient temperature. Already spaceport utility vehicles streamed towards it, ready to relieve it of its passengers and cargo. Thomas sat and watched the entire affair from the arrivals lounge. In its own way the cargo that ship carried was as important to the success of his business as his charter with the Review Board. He was forming a mercenary armor unit, and to do that would require armor. He also required an officer corps. That ship brought both to him. He could have obtained both here, of course. Galatea was known as the Mercenary Star for good reason. Literally anything you needed to form a mercenary unit could be found here, from weapons, to people, to the MRB, to prospective employers. Coming here for jobs and the MRB was unavoidable, at least for a newly begun outfit. Thomas knew better than to rely on Galatea for soldiers and equipment. Quality for either here varied wildly, and prices for quality versions of either were abnormally high. Galatea was, after all, a world of opportunists. Including him, he thought to himself. He snorted slightly in self derision as he considered that he had used his own contacts on Hesperus to get equipment at prices more favorable than usually available to mercenaries. He had also used his contacts within the LCAF to get soldiers he was sure would be better than the common dog of war. Ahead of him he saw the passenger tram pull away from the bulk of the DropShip. He stood and headed for the main arrival area. His new executive officer Freddie Marsden would be arriving soon. Immigration control on Galatea was surprisingly tight. One would think that on a planet where nearly anything was legal they they wouldn’t be all that concerned with a customs detail. This was not in fact the case. Thomas waited on the other side of the customs desk and surveyed the incoming group of travelers. They were almost all soldiers, he was sure. Most wore some kind of clothing with a military appearance, and most of those that didn’t wore the sort of outlandish clothing he had learned to associate with enlisted personnel wanting to stand out on a night out. Two people in particular caught his eye. The first was a swarthy skinned man wearing a sharp business suit and a tie pin engraved with the emblem of the Free Rasalhague republic. The second was the unusually tall and lanky form of the man he expected to see. Freddie Marsden struck a strange figure among the rest. He stood at least a head taller than any of them, and wore what appeared to be a LCAF uniform stripped of any sort of unit or rank insignia. His “uniform” was immaculate and his hair and nails were nearly trimmed. He was every inch the image of a professional Lyran Officer...except for the goatee. Freddie caught Thomas’ eye, and grinned. The wispy mass of the beard stayed stock still on his face as he did so, giving the impression it had somehow been affixed there with glue. He waved gaily and then stepped to the front of the customs line, transferring his grin to the agent there. Both Thomas and Freddie maintained reserve ranks with the Lyran armed forces. Even a resignation didn’t remove that. That meant that even fewer of the regulations that normally applied to arrivals on Galatea applied to them. Accordingly in less than a minute Freddie ambling over..
Freddie laughed, a full-throated belly laugh Thomas would have been embarrassed by in such a public place. They both had a chuckle at that. “How many of ‘our boys’ did we end up with?” asked Thomas. That was a considerably better turnout than he had hoped for. Thomas nearly gaped. “How did that happen?” he asked. Thomas felt his happiness melt away. Suddenly the prospect of having purchased little more than piles of burnt out parts had his stomach churning. Freddie placed a hand on Thomas’ shoulder. The sour feeling lessened but didn’t go away. Freddie was an aggressive commander, but he had never been the most technically proficient officer. The tanks were unlikely to be complete junk, but they could still be ruinously expensive to repair. The contents of Thomas’ stomach stilled. That did, in fact, make it a bit better. Dieter Mendelssohn and Thomas had been friends since they were both in the Defiance-sponsored primary school they’d first been educated in. They had been close friends for years. Dieter was one of the most talented engineers in Defiance’s employ. Freddie handed over a short silver cylinder. Thomas recognized it immediately as a key fob, similar to the sort used as an ignition lockout on a luxury vehicle. “What is it?” asked Thomas. Freddie’s smile was now a Cheshire-cat grin. Good read, as usual. I really like armor stories. There are too few of them in BT. One thing I'd like to mention: The guy's name is not "Deiter" but "Dieter", pronounced as "Deeter". Hope you can fix that. Good catch. I don't know how I missed that. It has been changed. Should be LCAF, not LAAF. Wouldn't be long until its AFFC instead. You are correct. I will correct this. Your avatar, is that the Shellbacks´ unit logo? Not really. I just found it online and thought it was a neat image. Their logo will likely be similar, but more cartoonish. They walked to a nearby warehouse that Thomas had leased. As they arrived, huge transporters were still carrying armored vehicles into the warehouse. The vehicles were shrink-wrapped with white plastic to protect them and the things around them during transport in a standard cargo bay. Freddie’s long legs carried him forward in energetic strides. Thomas found that he periodically had to jog to keep up. “What’s wrong with Bulldogs?” asked Freddie. Freddie’s pace quickened as he talked. Soon Thomas found that he was having tp jog almost constantly. Thomas didn’t even bother to respond as he found himself getting short of breath. They had made it through the doors of the warehouse. Thomas stopped short, breathing heavily after a few minutes of trying to keep up. Freddie’s rambling gait slowed to a stop and he looked back at his friend. He gestured deeper into the warehouse to a quartet of shrink-wrapped vehicles. Their huge, blocky outlines were ones that Thomas was very familiar with. “You got Pattons?” he asked. Freddie produced a pocket knife and strode to the closest of the shrink wrapped tanks. He made an incision into the plastic, and then began to peel it away from the hull. Thomas approached and did as he was told, pulling the glossy white wrap away. After a few minutes of work the two men had freed the vehicle from its cocoon. Freddie pulled the remains of the plastic away with a dramatic flourish. Thomas looked it over and realized that the profile of this Patton was slightly different than expected. “What’s with the gun?” he asked. Freddie’s smile threatened to remove his head from his neck. The weapon fit the profile of a heavy autocannon, but it was slightly off. It was smaller, and looking down the barrel Thomas could see that it was smoothbore. There was no sign of the typical rifling of a class-10 autocannon. “It’s a prototype?” asked Thomas. He frowned slightly. “What about ammo?” Thomas asked. Thomas gave his friend an arch look. That was something at least. It meant that Thomas should at least be able to fire the thing once he ran out of what Dieter had sent. It didn’t solve everything though. “What if it gets damaged?” he asked. He pointed to two clusters of canisters growing wart-like from the sides of the turret. Freddie shrugged. He was a born recon commander. Speed was his life, and he obviously disagreed with a static emplacement. He wasn’t about to disagree with the sentiment on something as slow as a Patton. Thomas looked at the launchers dubiously. Dieter might think that they were indispensable, but Thomas wished he had used the mass for something more useful. More armor, perhaps.Or another gun. Freddie poked him in the chest with a long, bony finger. “Your second best friend sends you a brand new gift, with technology not seen since the Star League, and you’re grumpy about it?” he asked. With a start Thomas realized that Freddie was right. Dieter was his closest friend, had been since they were both small enough to idolize soldiers, and he had obviously pulled a lot of strings to get this special tank here. He’d even thought enough ahead to coach Freddie through what he knew would be Thomas’ misgivings about the thing. Thomas frowned again, looking at the fob in his hand. The “starter” in this case would do nothing of the sort. The Patton was fusion powered and its power plant did not shut down under normal down-time storage. It would have been completely offline during shipping, but he could hear the faint whine of the reaction mass pumps and knew it was active. Hesitantly he raised the fob, pointing it at the tank. He hit the “remote start” button. The tank’s running lights lit, flashing through a diagnostic sequence. The gun raised and lowered, and the turret swiveled slightly from side to side. He heard the distinctive “chunk” of the lock on the commander’s cupola disengaging, and it swung open. Abruptly the PA speakers on the hull crackled to life, blaring the strains of the classic “We are the Champions”. Freddie was no longer grinning, but now holding his sides and bent over. He was busy laughing himself short of breath. Thomas was going to need to kill someone. I was expecting a holovid of Freddie Mercury rising out of the commanders cupola at the same time. I can assure you... that’s the truth! There were some other spelling errors as well. Those should be fixed now. You know that, and I know that, and Thomas does, in fact, know that. He's just not sure it's worth a full ton to have a pair of one-shot smoke grenades rather than getting smoke by other means. I'm actually a little surprised you don't see them on more Battletech vehicles. Freddie is a hovertank commander. They're all crazy. Wow: one-shot-half-ton smoke grenades - what is Freddie going fog up then? An Area the size of Texas in one go ? Nicely written, thanks for sharing!